Broadband Agreement Specialists, Inc. is an independent, unbiased, residential telecommunications consulting firm dedicated to providing clients with contingency-fee based concierge level agreement negotiation and management Services. With over 30-years of experience, we’re committed to negotiating residential Video, Internet and Voice telecommunications services and agreements, with the best pricing and technology available for our clients. Providing pay-for-performance, concierge broadband consulting services nationwide, we have an excellent track record and a solid reputation among our clients. 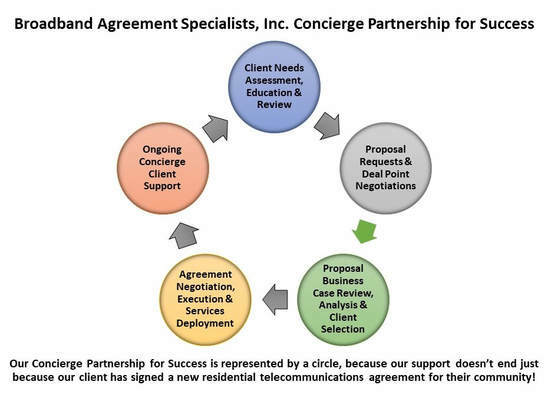 The Broadband Agreement Specialists, Inc. Concierge Partnership for Success is our proven process for providing concierge level consulting services, education and project management based on the individual needs of our clients. We have been very successful in negotiating new and renewal access, exclusive marketing and bulk cable + Internet agreement contracts resulting collectively in millions of dollars in savings and compensation for residential communities. At Broadband Agreement Specialists, we work for YOU as your community cable consultant advocate and expert with the telecom service providers. We educate and empower you to make the best possible decisions by facilitating the due diligence and negotiations on your behalf. Our fees are typically on a contingency fee basis, with a focus on obtaining maximum savings and/or compensation from service providers for our clients. Local and national telecom providers offer a host of quality product options and are the experts in their respective fields. Broadband Agreement Specialists, Inc. is your expert and advocate when working with service providers. Give us a call today for a FREE No-Obligation Informational Review and Consultation at 954.889.1967 or Toll-Free: 1.877.826.1625.